To prepare the chicken breast, I use LeCreuset's Grill Pan. This is the one that I have : http://www.amazon.com/Le-Creuset-Square-Skillet-Grill/dp/B00004SBI4 Wash and dry chicken. Heat pan, add oil. Cook chicken till cooked through. About 5-7 minutes per side depending on thickness. Add a splash of soy sauce towards the end. Cool and slice. Note that wheat berries are not berries but a legume which means they do need to be soaked overnight. Totally optional in the salad but do give it a nice texture. Note that this will make more wheatberries that you need for the salad but these are good to have on hand for other salads or make a nice hearty breakfast. Rinse the wheat berries well with cold water. Place in bowl filled with cold water and let soak overnight. Rinse and drain the water. Place in pan with water, bring to boil. Cover and let simmer for an 1 hr to 1 1/2 hrs till tender and chewy. Wash and spin dry arugula. Wash, dry and slice strawberries. Wash blueberries. Thinly slice red onions. Combine the above ingredients in a large bowl. For dressing, combine balsamic, lemon juice, olive oil. Mix well, add honey and dijon. Mix again. In a small, preheated skillet, toast almonds till light brown. About a minute per side. Dress salad. 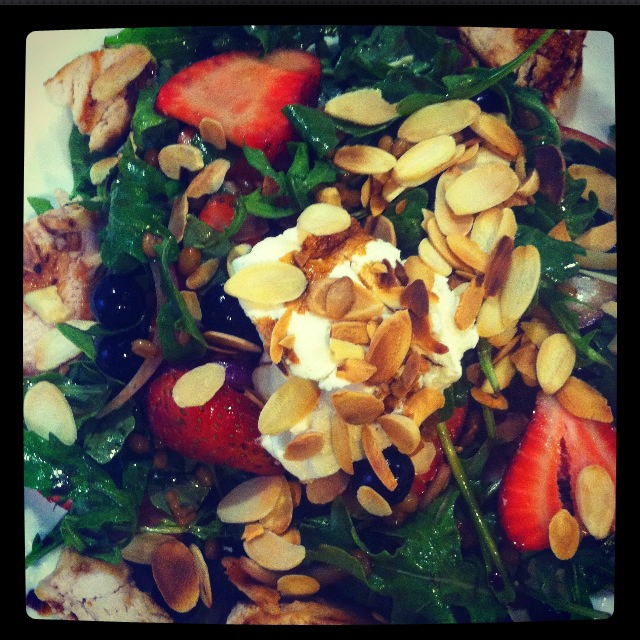 Top with chicken, scoops of goat cheese and toasted almonds. Serve and enjoy.